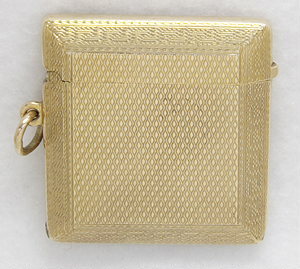 Magnificent engine turning is one of the most spectacular features of this art deco 9K yellow gold match safe. 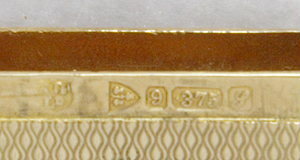 There is a Greek key design around the border. 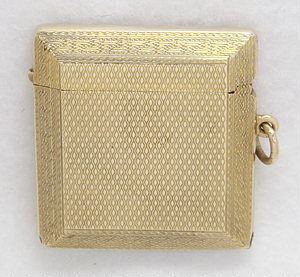 There is a hallmark on the inside edge. 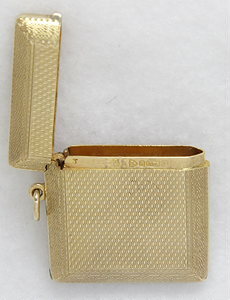 It is meant to be worn on a chain or chatelaine. It measures 1 5/8” tall, 1 1/2" wide and 1/4” deep. Circa: 1920.